A mod to restore several pieces of cut content in Skyrim. Hana - For a ton of beta testing my characters weren't able to do. Bethesda's rat's nest never stood a chance! nonoodles - Riften southeast gate mesh. Cleaned with xEdit 4.0.1 to remove additional ITMs that were not visible previously. The random encounter with the wandering noble should now properly clean up after itself. This will not fix encounters that have already spawned though. Froa should now move to Honorhall Orphanage if Keld and Iddra are both dead in Kynesgrove. Tolfdir will no longer give out the Rogue Wizard quest before the Saarthal quest has been completed. This matches with his other radiant quest in the same manager branch. If Uglarz is killed before returning to Narzulbur the quest will now properly fail as it should have. Facegen files for Froa were missing from the archive. A road sign west of Nightgate Inn was overlapping with another from Point The Way and has been adjusted. The collision box around Froa's bed was not set to L_NAVCUT so the NPCs naturally tried to walk through it to get to the chair next to it. The magic effect for Slid's Staff was using the wrong casting animations and causing the player to end in a casting stance when they shouldn't. 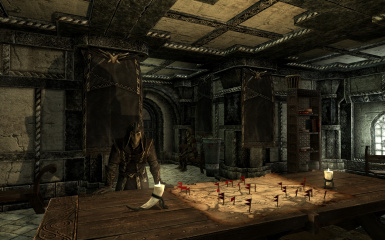 3 scenes where Xander will shop in Solitude have been restored. He will now visit Angeline's Aromatics on Tirdas and Turdas, Bits & Pieces on Middas, and Radiant Raiment on Fredas. A line at the end of the scene when stopping Potema's ritual in Wolfskull Cave has been restored. Shalidor's Insights: Magicka had a pitifully weak reward that was not in line with the difficulty involved in obtaining the reward. It also lacked a VendorItemScroll keyword. The pack spider could sometimes get lost when passing a load door due to not being persistent. The script has been modified to move him into the alias the quest had reserved for this. The Wayward Traveler did not have proper ghost or undead keywords set, and was dropping the wrong ash pile upon being killed. Froa's bed in the Braidwood Inn has been moved to a different wall to reduce conflicts with other mods. Talib's unfinished house in Stonehills that was accidentally left in with 2.0.1 has been completed and he now lives in it. 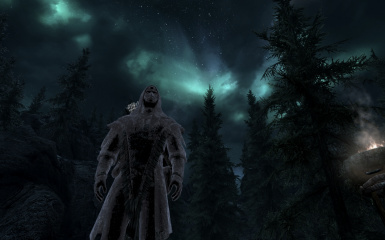 Glow spiders cut from the Dragonborn DLC have been restored. 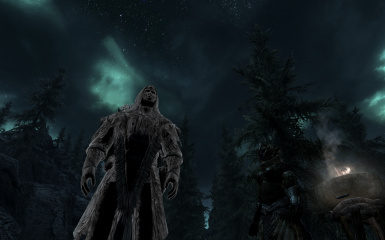 Omen of Warding and Stop Rune powers restored to the game on Solstheim. Pack spiders have been restored to the game. Crafting recipes have been added to Neloth's staff enchanting station for the Staff of Frost Rune, Staff of Fire Rune, Staff of Shock Rune, and Staff of Fade Other. Malkus will now carry the "Letter from Harkon" note. Vampire armor outfits will now include the Vampire Gauntlets that were never used. Barleydark Farm now has a pair of dogs living there to help defend against potential predators. Aleuc used a voice type that had no lines recorded for the blacksmith dialogue. The key to Barleydark Farmhouse should be labeled as Barleydark Farmhouse Key. Converted to Legendary Edition. All future support will be on this branch ONLY. Added road signs to various intersections near Stonehills and Heljarchen for the two villages. Enabled the "Mourning" quest which was blocked from running despite the dialogue being completely intact. When an NPC loses a friend or loved one, they may mourn the loss for a set amount of time before resuming their usual schedule. Fixed an issue with Orthorn's room not enabling if there were conflicting edits to Eye of Magnus (MG08). Orthorn is not essential so his room should not get activated in the College of Winterhold if he's dead before the time comes. Hern will now be enabled by default so that he and Hert can both access their unique dialogue for when he's around. Killing him prior to the Dark Brotherhood contract was already accounted for by Bethesda. Nightgate Inn can now be chosen by the game as a possible place for Sam to show up for A Night To Remember. Missing Apprentices will now be started via a notice pinned to the doorways in each of the major halls of the College. This resolves issues with the recorded dialogue not playing for some people. The script controlling Animal Pelt Collection (CR03) has been optimized so that it no longer uses a continuously updating script polling the game every 10 seconds. The counting method for getting pelts for Aela also properly handles dropping them. Please Note: CRF 1.1.7 is the final version that uses only the USKP as master that will be supported. No further updates will be made to this branch! All future support will be for the Legendary Edition ONLY. Trilf's sandbox AI did not have its interrupt flags set. Captain Metilius' sandbox AI did not have its interrupt flags set. Grushnag should be using a heavy armor outfit since his skill set is geared toward heavy and not light armor. The goat pen mentioned in dialogue about Froa has been added behind the inn in Kynesgrove. The College guard should no longer enter the Hall of Elements during Eye of Magnus until after you are told to kill Ancano. Grushnag had no weapon or shield in his inventory. Two meshes for the abandoned sawmill outside of Kynesgrove were accidentally left out of the package. 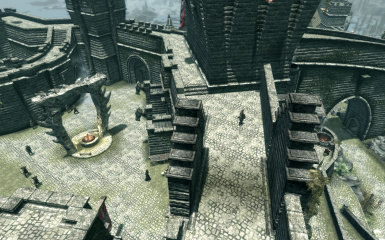 LOD has been generated for the various exterior locations that have been restored. Vignar Gray-Mane will now sandbox in Dragonsreach 3 days out of the week if he's not the Jarl. This enables access to a scene that doesn't play due to him never going there otherwise. Forsworn Warlords have been added to the various Forsworn leveled lists they were never made a part of. You can begin encountering them at level 46 and above. Restored the very short Runil's Dark Past. Speak to him after retrieving his journal (and reading it) to get the dialogue for it. An unsent letter from one of Peryite's afflicted has been placed in Bthardamz Workshop. 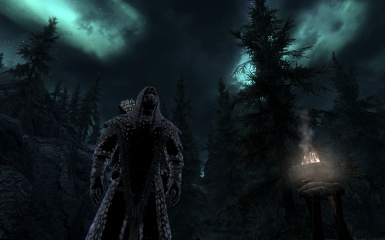 Orthorn needed to be added to the College of Winterhold faction, as well as the crime faction for the city of Winterhold. The initialization script failed due to the Reset() call for Missing Apprentices being in the wrong order with the Stop() call. Chickens at Barleydark Farm had no ownership. Missing Apprentices will now be a start-game-enabled quest to prevent issues with the aliases getting blocked due to picking up the existing items in the quest. Phinis College lecture about the apprentices will be rigged to play first so that the quest gets a proper chance to start the way it was intended. Froa, missing Nord child of Kjeld and Iddra, has been restored in Kynesgrove. Frostbark Lumber Mill, mentioned by Ganna, has been restored to the game in the intended location along the river across from Kynesgrove. Orthorn has dialogue implying he'll return to the college at a later date. He will now go to the Frozen Hearth in Winterhold and sandbox there until the player becomes Archmage. At that point he will take up a normal routine at the College itself. The civil war soldier swap at Frost River was not being done correctly. The markers for the local soldiers are now parented to the markers in Morthal and will switch when Morthal switches. The map marker at Heljarchen now has an enlarged radius so it will be discoverable from the road. The "Staff of Fading" was created to make use of the "Fade Other" staff enchantment that was left hanging. It has been added to the LItemStaffIllusion50 leveled list. "Staff of Fire Rune", "Staff of Frost Rune", and "Staff of Shock Rune" have been created to make use of the respective staff enchantments that were created but never used. The 3 staves have been added to the LItemStaffDestruction50 leveled list. The original visual effects Bethesda made for Iron Flesh, Oak Flesh, Ebony Flesh, Stone Flesh, and Dragonhide have been restored. The added residents of Stonehills (Argi, Aleuc, Talib) will now have proper burial urns in Solitude if they are killed. For Argi and Talib, this change will not take effect on an existing save. The residents of Heljarchen will now have proper grave sites if they get killed. This change will not take effect on an existing save. Merged necessary quest fix for Ill Met by Moonlight from USKP 2.0.8. Merged necessary quest fix for Rannveig's Fast from USKP 2.0.7. Letter to Vals Veran was added in Hillgrunds Tomb. Imperial War Horn was added to General Tullius' quarters. Nord War Horn was added to Ulfric's quarters. Restored the fortify magicka scroll reward that was left out for Shalidor's Insights. Several articles of clothing that were not added to leveled lists are now available. Minor subtitle typo fixed in the Whiterun stables scene. The spell tome for Fade Other should have been valued at 800 instead of 80 since it's a more powerful extension of Invisibility. The Vault of the Vigilants did not have the key assigned to it. The Briarheart Geis needed MagicDisallowEnchanting added. It also did not have its critical damage value set. "Mzinchaleft Guard's Note" has been placed outside Maluril's door. "Habd's Death Letter" has been added in Frostflow Abyss. Sild's Staff has been given to him in Rannveig's Fast. The dunRannveigSummonGhost enchantment also needed the base cost corrected downward and the magic keywords attached. If you've already been there and killed him, the staff will be sitting on a table near his work area. Circle of Vitality has been completed and added to the game. It will become available when the Restoration Ritual is completed. Two of the Saarthal Miners have been added to the game. Restoring the other 4 would have been silly as they are simply clones of the two that have been placed. Plus the Saarthal Excavation just doesn't have room for that many NPCs. Stormcloak Cuirass (sleeved version) has been added to the leveled lists for Stormcloak gear. The CarryActorScript setup was missing from one of the farmers at Frost River Farm. Supply Line would not mark the journal as completed when finished. It also should have been marked as a Miscellaneous quest so it wouldn't have empty journal entries showing in the log. The unused College Guard has been added at the College of Winterhold. He'll now patrol the grounds, as well as stand watch during part of Revealing the Unseen and Containment. Restored a line of dialogue for Barbas in A Daedra's Best Friend (DA03) where you can ask him why Vile kicked him out. Frost River Farm has been resurrected from the depths of obscurity. It now occupies space in western Hjaalmarch, along the border area near Dragon Bridge. The "Supply Line" quest that goes with this location should now be available by speaking to Signar Iron-Blood at the farm. Irontree Mill has been relocated to Hjaalmarch next to Frost River Farm. The coastal location was not really appropriate. Trilf's House has been resurrected from the ether and placed next to the newly relocated Irontree Mill. Steirod will live there with him. Trim gap and wall seam repaired on the new Riften southeast gate using an old USKP mesh to copy parts from. Corrected a typo in FreeformCollegeAInitResponse1. Corrected two typos in NarzulburFreeFormWifeQuestSharedInfos. With Nazeem and Ahlam living in their proper house now, Jenassa has been given bed linkage to the now vacant upstairs bedroom. Marrying her will now cause this to become a valid location to get the Lover's Comfort bonus. Her sandbox package in the location has also been modified so she'll make full use of the entire cell. 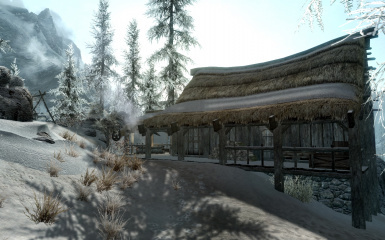 The restored scene at the Whiterun Stables should not be attempted if With Friends Like These (DB02) has started. Two cut lines of dialogue intended to be spoken by Eorlund Grey-Mane have been restored. The Wayward Pass ghost did not have its ghost script properties set. May not take effect on existing saves. Room bounds in Left Hand Mine needed to be expanded to include the exit from Cidhna Mine. Added the Briarheart Geis for the boss at Lost Valley Redoubt. Added some miscellaneous notes cut from the game. Added The Secrets of Ragnvald to the room where Otar the Mad spawns. Enabled Ghorbash's Ancestral Axe. Should be mounted over his bed in his longhouse. 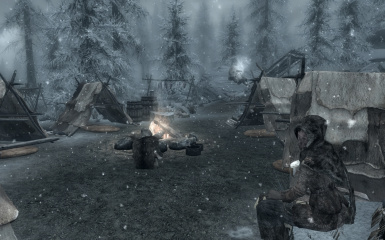 The restored dragon encounter outside of Bleak Falls Barrow never allows the dragon's corpse to be cleaned up because the quest controlling him is never stopped. The dragon has also been swapped from a static reference to a leveled instance of a dragon. Rogue Wizard will not enable the target until Tolfdir actually gives the quest to the player. Fixed a mismatched subtitle for Uthgerd's scene at the Whiterun Stables. Makhel Abbas had AI problems that were not worth attempting to resolve so his reference has been removed. The boarded up southeast gate in Riften has been restored to a functioning entry point. 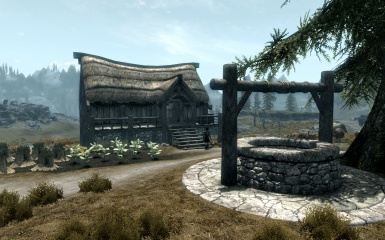 Karinda (Dagny's horse) has been placed at the Whiterun Stables. Not used in anything other than being there for extra decoration. The following unobtainable spell scrolls have been added somewhere in the world: Scroll of Dead Thrall, Scroll of Dragonhide, Scroll of Flame Thrall, Scroll of Frost Thrall, Scroll of Storm Thrall. No, I'm not going to tell you where to find them. Go exploring! The Fade Other spell (invisibility cast on others) has been given a spell tome and added to Drevis Neloren's expert spells list. Drahff's confidence value in AI has been lowered from Foolhardy to Average to allow the intimidation option for his scene a realistic chance of succeeding. Fixed two gaps in Dwemer ruin structured in the Cidhna Mine section that was restored. Fixed a bandit chest in the restored Cidhna Mine section that was rotated backward. Fixed some overlapping potion bottles in the restored Cidhna Mine section. Lilith Maiden-Loom's house has been restored to the game. She takes over the space across from the Whiterun Stables. Wintersand Manor has been relocated to the property at Chillfurrow Farm. Restored the Spectral Arrow spell as a reward for completing Treva's Watch. The decoded version of Gallus' Journal will appear in Nightingale Hall next to the beds after the Twilight Sepulchur is done. Reconfigured the directional facing for Wintersand Manor to avoid a direct conflict with Touring Carriages. Restored access to the cut portion of Cidhna Mine and repurposed it as an escape route for being in jail while not doing the Forsworn quest. Added the Supple Falmer Bow to 3 of the encounter varieties of Falmer. Provided a tempering recipe for it as well. Added an AI pack to send Scouts-Many-Marshes to the New Gnisis Corner Club which will provide access to 2 scenes that were created but never get used. Cleared up some navmesh issues at Barleydark Farm around the wheat stalks. Fixed a gap in the archway behind General Tullius bedroom after the wall was removed to provide access to the tower. The jester objective is never cleared if the Dark Brotherhood quest line is started without visiting Cicero on the road. Enabled Ennodius Papius since he has recorded dialogue available for before the Dark Brotherhood quest to kill him. 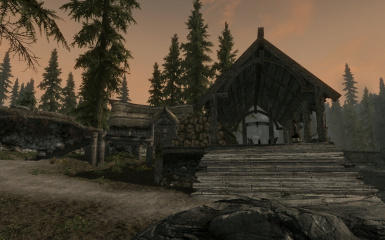 Wintersand Manor has been restored across from the Whiterun Stables. 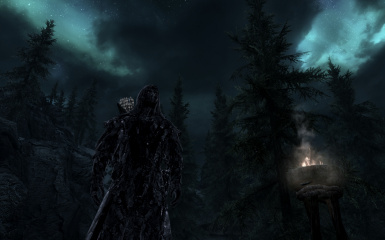 Restored dialogue for the Vigilants of Stendarr to confront the player when they are wearing/wielding Daedric artifacts. ++ Don't worry, if you surrender an item it won't be lost unless you want it to be - the Vigilants will whisk it away to their hall. ++ Yes, if Dawnguard is loaded the vault they speak of will be available in the exterior should you need it. Restored a scene between Uthgerd the Unbroken and Skulvar Sable-Hilt at the Whiterun Stables. A trigger box for a scene with Mikael in the Bannered Mare was enabled so it would run as intended. Preferred path fixes to the navmesh in Stonehills. For the Companions, if Aela has given you more radiant quests than Farkas, she will be your Shield-Sister for Proving Honor. Corrected another issue with Research Thief where ratting Nirya out to Faralda did not clean up the generated notes. Corrected an issue where the Jarls would have dialogue for Rogue Wizard before Tolfdir had actually given you the quest. Ilas-Tei's corpse was using male Argonian parts despite Phinis clearly saying Ilas-Tei is female. Yisra already had a vanilla scene placed for finding her so the quest has now been corrected to make use of that instead of the one I added for it. Be aware this will reset the quest, so if you've got it in your journal already, finish it before you update the mod. The 4 quest items to gather for Missing Apprentices will no longer be added to Phinis' inventory when turned in because he tries to turn around and sell them to you later. Corrected an issue with Missing Apprentices where it was not properly handling the two daggers that need to be turned in if they had been taken from their original places. Mithorpa Nasyal has been given a boost in his levels (from 4 to 16) so he'll have a better chance of surviving in his somewhat remote location. Herebane Sorenshield was not consistently going hostile toward the player because his aggression settings were too low. Restored the Narzulbur wife quest. Doing so also activates some post-quest dialogue in Narzulbur that was already set but could not be accessed. A content restoration mod for Skyrim and the official DLCs. From the depths of the ether, or just the cutting room floor, comes forth several NPCs, some quests, and other miscellaneous content which was created but never implemented in the game. If ever you had the feeling that Skyrim was missing something, you were probably right! This mod should relieve a bit of that. Villages that were supposed to exist have been brought back. Quests that were partially implemented have been completed. Various items have been restored that were still in the data files. NPCs have been brought back to the game and given homes where appropriate. Plus plenty of other random bits of stuff that was mentioned in the game but didn't exist yet. Cut civil war content is far too complex for me to want to mess with, so for that I'd recommend Simtams's Open Civil War. Unofficial Skyrim Legendary Edition Patch 3.0.14 or greater. Use the "Download with Manager" button on the Cutting Room Floor page at Skyrim Nexus. The installer should take care of things from there. Drop the Cutting Room Floor.esp and Cutting Room Floor.bsa files into your Data folder. Due to the nature of Skyrim mods, especially those with scripts, it is STRONGLY recommended you do not attempt to uninstall this mod once you've begun using it. The scripts altered by the mod, as well as several portions of the content will be permanently altered and will not restore themselves to their previous states. This is not a defect in this mod, it is merely how Skyrim works with any mod that includes scripted changes. There is nothing I or anyone else can do about this. You need to load a save prior to having installed this mod in order to restore the game to its previous condition. If you insist on removing the mod and continuing with the save though, the Cutting Room Floor.esp and Cutting Room Floor.bsa files must be removed from your Data folder. Any errors or residual changes left behind by doing so are your sole responsibility and any complaints about this will be ignored. Load early, as close to the top of your load list as reasonably possible since this mod deals in restored vanilla content. Argi Farseer - Stonehills. Works in the mine, has a home in Stonehills, takes a random stroll around the mining camp at night. Talib - Stonehills. Restored his house, works the mines. Aleuc - Blacksmith in Stonehills. Has a house and slightly modified exterior forge area. Stonehills ought to be plenty populated now. Captain Metilius - Castle Dour. Hangs around the war room during Bleak Falls Barrow or Jagged Crown, wanders the castle district outside otherwise. Will be disabled if the Stormcloaks have Solitude. Grushnag - Placed with the Markarth Khajiit caravan and will travel with them. Serves as a guard due to the dangerous nature of The Reach. Herebane Sorenshield - Added on the span of Kilkreath Ruins between the first and second interior areas. He will patrol the area there and is now carrying his named reward items too. Karinda - Dagny's horse that was originally planned for use in the darker side of The Whispering Door. Just for show now though. Mazgak - Added to the hunters in Bloated Man's Grotto. Spirit of the Ancient Traveler - Added at Wayward Pass as was apparently intended. Steirod - NPC planned for use at Irontree Mill. Trilf - NPC planned for use at Irontree Mill. 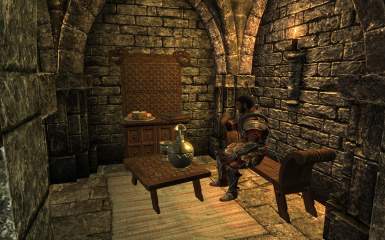 Sulvar the Steady - Placed in Niranye's house, spends the rest of his time at the warehouse. It made no sense for him to spend his entire existence in her place. Tasius Tragus - Added in the Dragon Bridge tavern. Doesn't do much other than sandboxing inside and outside. Sleeps at the inn. Supposedly is Varnius Junius' boss. Thjollod - Added to the hunters in Bloated Man's Grotto. Viding - Added to the hunters in Bloated Man's Grotto. Mithorpa Nasyal - Dark Elf NPC assigned to Barleydark Farm. Uglarz - Restored for Narzulbur, involved in a quest. College Guard - A generic guard for the College of Winterhold. Will patrol the grounds, and sleep upstairs in the Hall of Attainment. Froa - Daughter of Kjeld and Iddra who is mentioned in at least two scenes but doesn't exist. Guards restored for Half-Moon Mill who will use the cut dialogues for that location. Gallus' decoded journal - Will appear once the final major portion of the Thieves Guild quest is done. Spectral Arrow - Spell tome reward for completing Treva's Watch. Falmer Supple Bow - A slightly better version of the normal Falmer bow. Added to 3 of the encounter varieties of Falmer. A tempering recipe has been provided as well. Briarheart Geis - A special version of a Forsworn axe, now in the hands of the Briarheart at Lost Valley Redoubt. Mzinchaleft Guard's Note - A note for the guards who are watching Maluril's room. Habd's Death Letter - A note left behind by the former owner of Frostflow Lighthouse. Sild's Staff - A unique item available on Sild the Warlock in Rannveig's Fast that summons subjugated ghosts. Circle of Vitality - Added a new tome for the spell, plus completed the missing parts. Stormcloak Cuirass (sleeved version) - An alternate version of the standard Stormcloak Cuirass that was never added to the game. Letter to Vals Veran - A short note that provides a bit of backstory to Vals Veran. Robes & Boots - Several articles of clothing that were not added to leveled lists are now available. Letter from Harkon - A short note carried by Malkus talking about Harkon's promise for finding a Moth Priest. The Missing Apprentices - Phinis Gestor wants someone to find out what happened to the previous group of apprentices. Animal Pelt Collection - Restored a radiant quest for the Companions to collect animal pelts. Needed some logic tweaks and bugfix hacks to get it into useable shape. Hitting the Books - An extra dialogue exchange was restored between the player and Mirabelle Ervine. "A Wife For Mauhulakh" (name provided by CRF) - Chief Mauhulakh is lonely and longs for companionship. 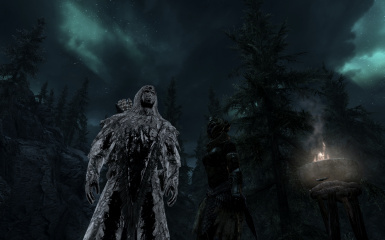 Proving Honor - Aela can now be chosen as your shield-sibling if you do more work for her than Farkas. Suppy Line - Frost River Farm needs help distributing their mead. Shalidor's Insights - Added the missing fortify magicka scroll to the reward table. Runil's Dark Past - Restored what little there is for this. Need to retrieve his journal first before the dialogue becomes available. Mourning - NPCs who lose friends or loved ones may mourn the loss for a set period of time. DialogueWhiterun - Scene between Uthgerd the Unbroken and Skulvar Sable-Hilt at the Whiterun Stables. DialogueWhiterun - Scene where Mikael thanks the audience for their applause as the player first enters the Bannered Mare. Windhelm - 2 scenes between Scouts-Many-Marshes and Ambarys unlocked by giving Scouts-Many-Marshes an AI pack to sandbox in the club after work. Solitude - 3 scenes involvng Xander have been restored by giving him AI packages to go to each of the stores he should visit. MS06StartPotemaEscapesScene - Removed condition blocking the dialogue from Potema's escape sequence. Thalmor Justiciar HQ in Solitude - Populated with one commander and 4 justiciars who will disable if the Stormcloaks take Solitude. Banners changed from Imperial to Thalmor, and these banners will change again to Stormcloak ones if they take the city. Castle Dour Tower - Restored access to an unused tower room above General Tullius' room. Captain Metilius will sandbox here for part of the day as well as sleep here since he has no bed otherwise. Frost River Farm - The meadery that goes with the Supply Line quest that was restored. Irontree Mill - Restored a missing sawmill originally designated for Haafingar Hold. Haafingar has no adequate space for it, so it's just over the border with Hjaalmarch, located next to the newly restored Frost River Farm. Steirod and Trilf live and work here. Trilf's House - Added with the relocation of Irontree Mill after discovering that there is a key and location data for a house. Since Steirod has nowhere else to go, he'll be living there too. Barleydark Farm - Restored a farm southwest of Fort Greymoor occupied by Mithorpa Nasyal. The location was already leveled out and labeled, just never actually built. 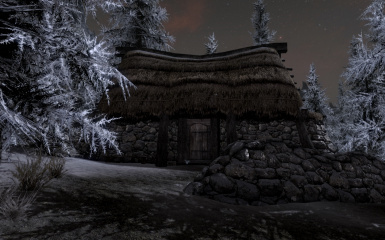 Wintersand Manor - Nazeem & Ahlam's house, restored to the game at Chillfurrow Farm. Maiden-Loom Manor - Lilith Maiden-Loom's house, restored to the game across from Whiterun Stables. Cidhna Mine - Obscured Passage, restored and repurposed as an escape route out of the prison. Frostbark Lumber Mill - The abandoned remains of the sawmill that Ganna tells you about in Kynesgrove but was never added to the game. Riften - Restores the southeast city gate to the game, which was boarded over prior to release for some reason. Help! There's a duplicate farm sitting on top of Frost River Farm! You are probably using my Alternate Start - Live Another Life mod. Frost River Farm was built from the data provided by LAL and will overlap the entire exterior, which will lead to performance degradation, severe z-fighting, and a duplicated set of farm people operating the site. Plus it will probably be random luck as to which building you enter if you try to go through the door. You will need to upgrade LAL to version 2.4.0 or higher in order to resolve this conflict. 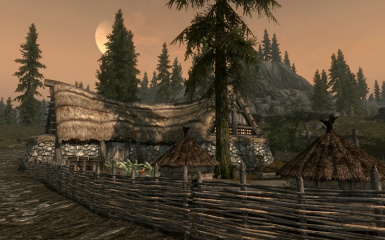 LAL 2.4.0 relocated the farm to a plot of land north of Rorikstead. nonoodles - Meshes used for the restored Riften southeast gate.